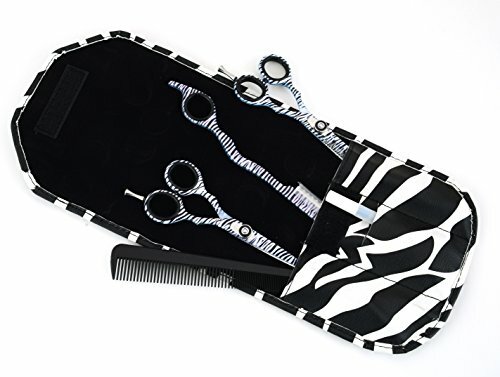 Awans Hairdressing Barber Salon Scissors 5.5 Inch/Thinning Scissors 5.5 Inch/Thinning Razor Set, Zebra Pattern. Package includes 1x Hairdressing Scissors 5.5″, 1x Hair Thinning Scissors 5.5″, 1x Hair Thinning Razor Universal size. Comes in a matching pouch. Excellent Top Quality Brand New Hairdressing Set. The product is made to the highest specification and is quality tested . This has made it the choice of professionals .buy with great confidence. Hand crafted from top quality stainless steel. Adjustable tension screws which makes it customized for use. Comes with a beautiful Zebra pattern designer Pouch. Removeable rubber rings and finger rests.